How the Queensland Licencing Reforms Stack Up! QLD will soon have it's very first Refrigeration and Air Conditioning Occupational Licence - More Work Still To do Though! ARMA and ARA extend their sincere gratitude to all the supporters that sent in submissions and making a difference. On April 9th 2018 the QLD Parliamentary Committee approved the Plumbing and Drainage Draft Bill 2018. QLD Parliamentary Committee members - LNP members Hon. Colin Boyce, Hon. Ted Sorenson, and KAP member Hon. Robbie Katter expressed great concern in support of the HVACR industry and working with refrigerants, seeking significant industry collaboration on reviewing the refrigerants, high pressure and safety of the public and workers (Refer to letters supplied by these members below). ARMA and ARA are deeply grateful for their suport reflected throughout the committee report and the support of the Shadow Minister for Transport and Public Works, Hon. Michael Hart. The bill has yet to be tabled in QLD Parliament to be passed, this we anticipate will occurr in May 2018 when parliament next sits. ARMA and ARA will consult with government on technical competencies for the RAC licences and the now supported (RIS) Regulatory Impact Statement. What does this mean for you and your business and as an employee? An occupational refrigeration and air conditioning licence will be introduced regardless of the value of the work and regulated by the QBCC (Regardless that there is mention in the QBCC section of the plumbing and Drainage Bill 2018- Plumbing will not be controlling the RAC licencing). We have yet to determine when the occupational licence will be introduced and will advise accordingly. The RAC occupational licences will exclude splits systems (We will continue to lobby against this and your lodgement of refrigerant leaks via the Mates Rates for Fridgys App will help us to provide valuable data to support our claims. The RAC occupational licences excludes duct work, however as RAC contractor's licencing has not changed (Still required for work valued at $3,300 and over) then the contractor has the ability to carry out the ductwork using their RAC occupationally licenced employees. - We are currently seeking confirmation of our interpretation on the duct work and the legal application for occupational RAC licences and will advise asap. Earlier reforms to the QBCC legislation now includes harsher penalties if you don't report an incident, we emphasise the need to report all unsafe work and related incidents. ARMA can lodge complaints now on your behalf once we recieve the following complaint form from you, we have kept it as simple a process as possible so you can complete the complaints form while onsite. We are now also seeking reports of refrigerant being released into the atmosphere, complete "Notification of Refrigerant Loss" if you are not lodging a complaint and help us to collate this valuable data. 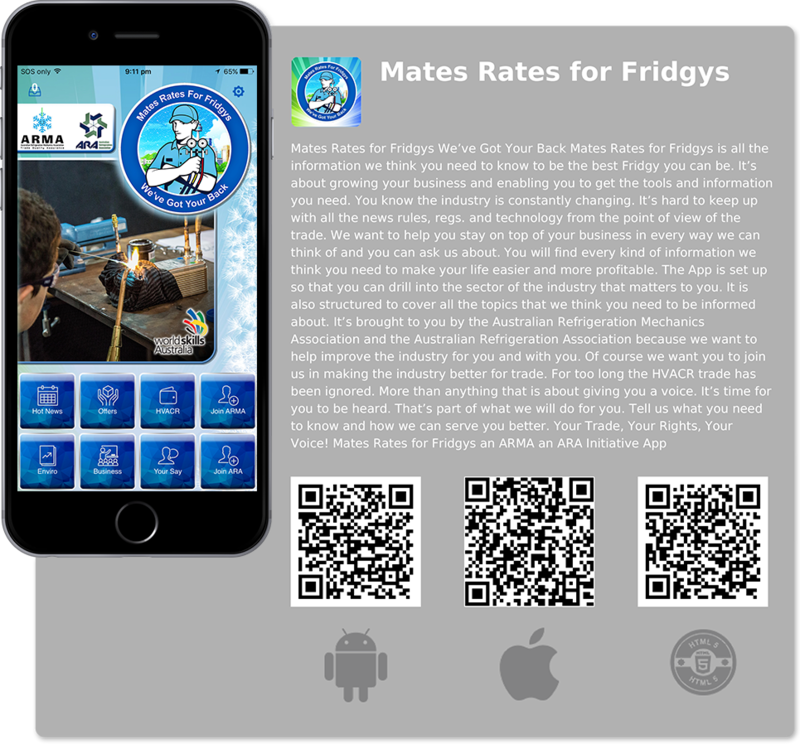 Both forms will be available on our Mates Rates for Fridgys App, an ARMA and ARA initiative, click here to scan the QRcode and download the app. Mechanical Services - Plumbers - The Arctick licencing is certificate II only which excludes mechanical services from working on commercial works with regard to high pressure refrigerants, adding refrigerant or working on refrigeration systems. The current work mechanical service carry out should not change in QLD. Mechanical Services - Refrigeration and Air Conditioning (Limited design licence) the limited application is the same as what RAC contractor's are currently operating under. Mechanical Services - Refrigeration and Air Conditioning (Unlimited design licence) the limited application is the same as what RAC contractor's are currently operating under. Mechanical Services - Medical Gas, this licence requires assesment of competencies and we will work to hard ensure RAC certificate 111 are included when we are participating in discussions of technical competency requirements. ARMA and ARA extend their deppest of gratitude to the LNP Shadow Minister for Transport and Public Works, Hon. Michael Hart, LNP parliamentary committee members, Hon. Colin Boyce, Hon. Ted Sorenson and KAP member, Hon. Robbie Katter, please take a few minutes to email them your expressions of gratitude.